We're now on our third last day in Tokyo and the plan was to visit Tsukiji Fish Market for breakfast. The bro, bff and I were the only ones who went because the mother couldn't take any raw food so we left her with breakfast from McDonalds next to our hotel and left for the fish market. I won't leave any directions for this market as it's slated to be closed at the end of 2016, moving to another larger site to house the fish market. Nevertheless, this age old fish market is an icon of old Tokyo so I thought best to pen this down for memory's sake. 3rd pic above is a famous place serving tempura. This is located along the same stretch as Sushi Dai and Sushi Daiwa. Not too sure about how long they take to serve food though. We randomly selected one of the sushi restaurants at a much more quieter spot within the market. The 3 of us ended up being their only customers for the entire hour we were there although 2 tourists got turned away when they wanted to order 1 set to share between themselves. The place was filled with tourists by the time we arrived and because of the huge influx of visitors then, it took us some time to choose our yukatas and get dressed. The staff will help you to wear all the attire properly and even provide hair styling services. After getting ready in our yukatas, we left our belongings at the studio (we only carried our valuables such as passport, wallets and cameras) and went to Kaminari-mon gate. As usual it was crazily crowded both with tourists and locals alike but I loved the experience off walking around in our pretty yukatas! The brother actually ran off to explore on his own because he couldn't be persuaded to join in our experience lol. Got hungry while walking down towards Senso-ji Temple and got some snacks. Nakamise Street is lined with shops that sell all sorts of food, souvenirs and Japanese memorabilia. At the end of this long street, you will reach the entrance of Senso-ji Temple and that was where we started to get annoyed. Got a tourist to help us take this picture at the entrance to the temple and then we got bombarded by hordes of tourists wanting to take our pictures, thinking that we were Japanese. And despite us declining very politely because having your picture in some stranger's camera is just too darn weird for us plus we were not Japanese, they kept insisting and we ended up having to hide in one corner of the temple to fend off all the photo requests. Had to walk away really quickly and be constantly taking pictures so do bear this in mind if you plan on going for the kimono experience at Asakusa. Ugh. Tried getting a Omikuji at the temple's entrance again. 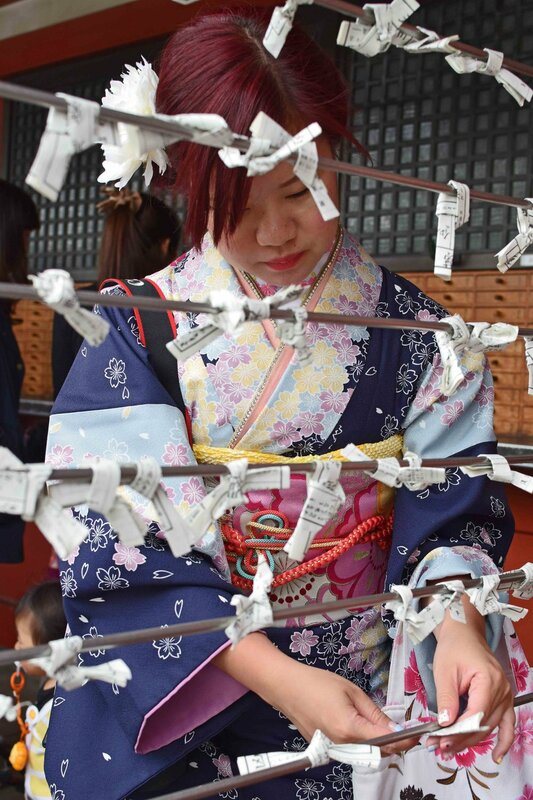 Anyway tradition dictates that you tie your bad fortune to the metal wires and to signify leaving your bad fortune behind at the temple which was what I did (but still ended up having a bad year SIGH). We managed to reach the temple's main hall and then it started pouring. Got stuck there for a good 30 mins and just camwhored to make our money's worth in renting the yukatas lol. Had to fend off more tourists then because we had nowhere else to escape to since it was raining. Got pretty pissed off because they kept snapping non-stop as if we were some animals in an exhibit and my mum was pretty uncomfortable at that. Haix. So yes, please be prepared to get such weird requests if you are planning on renting the kimono/yukata in Asakusa. Went back to the studio after about 3 hours to change back into our clothing. So thankful to be out of the yukata as it was pretty tight. Lunch was this tempura/tendon place called Tempura Daikokuya (directions here) and it was very yummy! Highly recommend this if you are in the Asakusa area and want to grab some authentic tempura. Ordered a bowl of tendon each and the restaurant actually provides menus in English so fret not. Moving on from Asakusa, we then headed over to Tokyo Skytree but the weather didn't like us. It was totally gloomy with a light drizzle but since we weren't planning to head up to the Skytree, we just walked around the shopping areas there. Didn't have time to go in and eat because we already had lunch then but I will definitely go back one day! Went back to Shibuya for more shopping and in between we stopped by Mos Burger for tea break. Got distracted by their seasonal burgers and decided to share with the bff one burger. And... that's all for the entire entry! Stay tuned for our last day in Tokyo where we went to a festival near Mt Fuji.